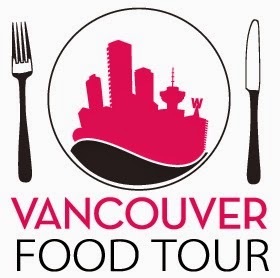 For the longest time, I've never had the opportunity to experience the original Vancouver Food Tour. Strange, in the meantime, I've gone on practically every other tour that our city has to offer. Even after some invites, I still couldn't make it. Was it the food gods trying to prevent me from ever experiencing it? Was I scared of Melody Fury? Maybe... No, of course not! Well, finally I was able to make one - the Modern Chinatown Tasting Tour which is aptly named since the food scene in Vancouver's Chinatown is rapidly changing. Call it gentrification or call it the relocation of Chinese focus to Richmond, the choice of cuisine has never been any more diverse than we have now. Meeting up with Carlos and some other guests in front of the Sun Yat-Sen Gardens, we were given some brief information about the history of the area while walking over to our first stop - Calabash Bistro. 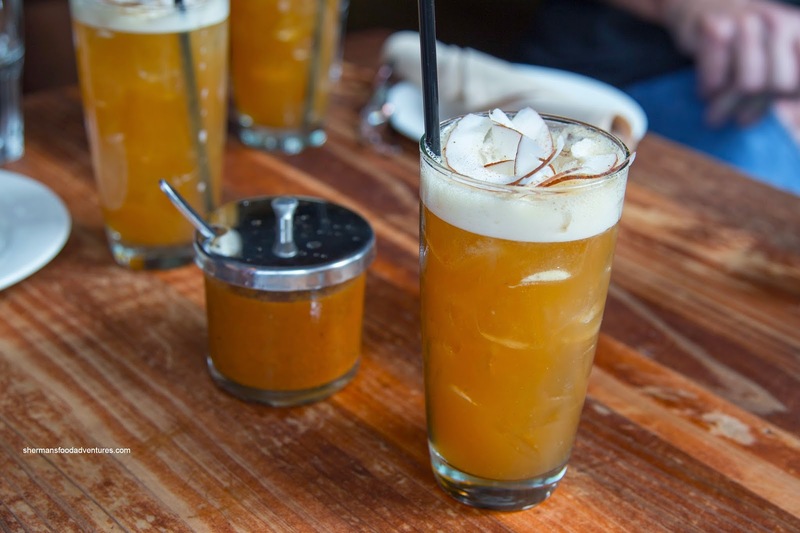 We were started off with a Calabash Dark and Stormy which is their take on Bermuda's national drink consisting of ginger-infused Goslings Black Seal with homemade ginger beer, Angostura bitters and house-made ginger syrup. Suffice to say, this was one gingery drink with a definite bite. At the same time, it was refreshing especially on a warm day. Then we were presented a large platter which included 3 types of Patties including veggie, chicken and beef. 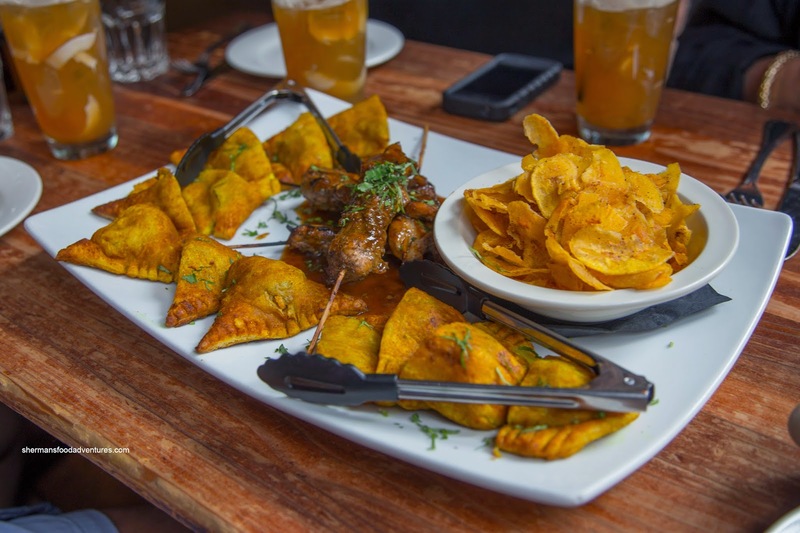 In the middle was Jerk Chicken skewers and on the side, Plantain Chips. These patties were soft and doughy rather than flaky. However, that didn't mean they weren't good though. I found them warm and pillowy with a purposefully spicy filling. I liked the beef one the best as it was moist and had depth-of-flavour. As for the jerk chicken, it was moist especially for white meat. The jerk sauce was tangy with a touch of spice and sweetness. Already halfway full from the appies, we sauntered over to Mamie Taylors. 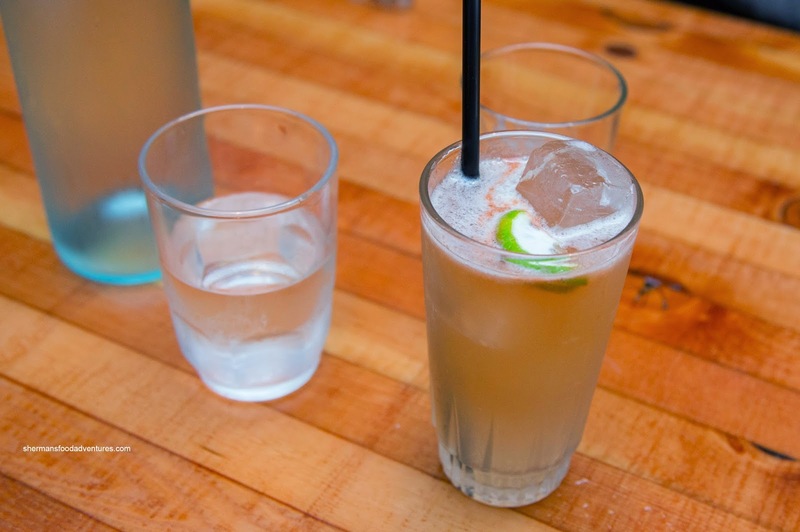 As if one cocktail wasn't enough, we were treated to the Mamie Taylor made of scotch, fresh lime juice, ginger beer and angostura bitters. Somewhat similar to the dark n' stormy at Calabash but lighter with less bite and a touch more acidity, it was another refreshing drink. Oh and they also served us a glass of wine too. Was this a beverage tour too? We weren't complaining! 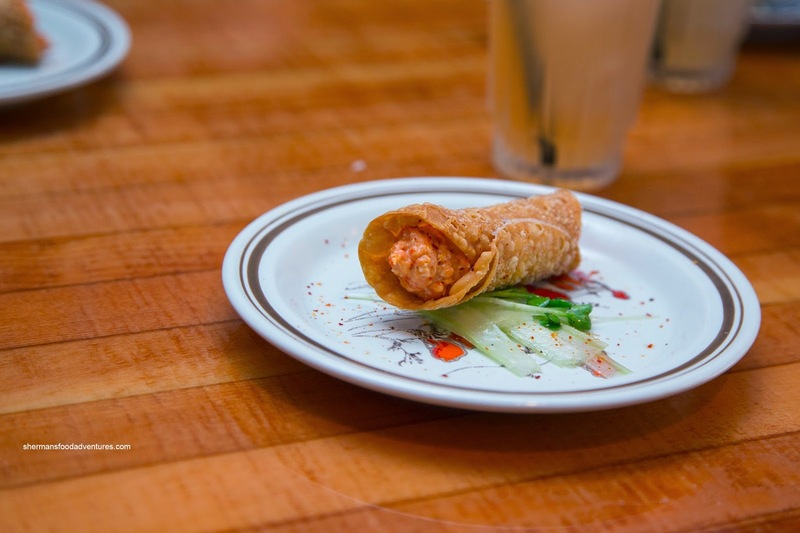 For food, we were presented with Pimento Cheese stuffed in a paper thin cannoli on top of celery salad and espelette. I enjoyed the cannoli itself because it was light and crispy. Too many times I've had overly thick and crunchy versions. Inside, the pimento cheese was moderately chunky while still smooth with big hits of salt and a touch of spice. The food didn't end there as we were served 2 more including the Turducken Scotch Egg and Smoked Albacore Tuna. 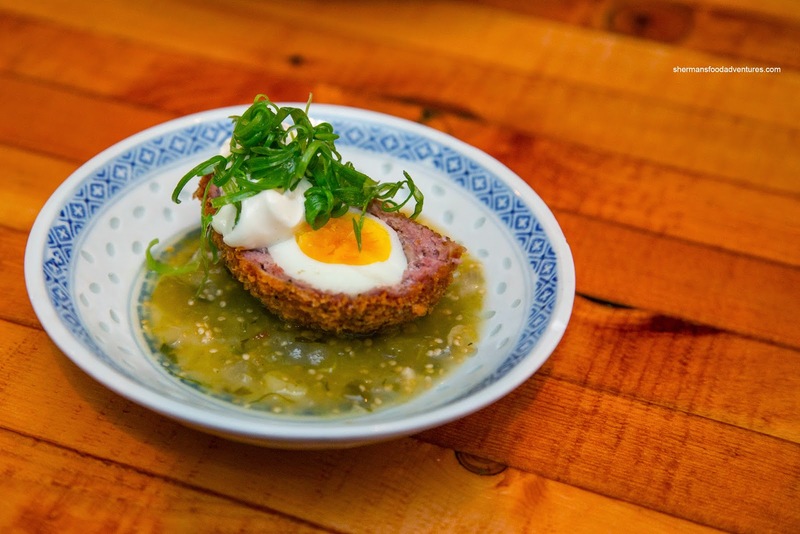 The scotch egg sat atop tomatillo while dressed with garlic mayo and scallions. I've had this dish before and it didn't disappoint this time around. The egg was not overcooked, hence it was not rubbery. The sausage was moist and meaty with lots of depth. It was encased in a lightly crisp exterior which completed the range of textures. The bright and zippy tomatillo sauce brought the dish alive. 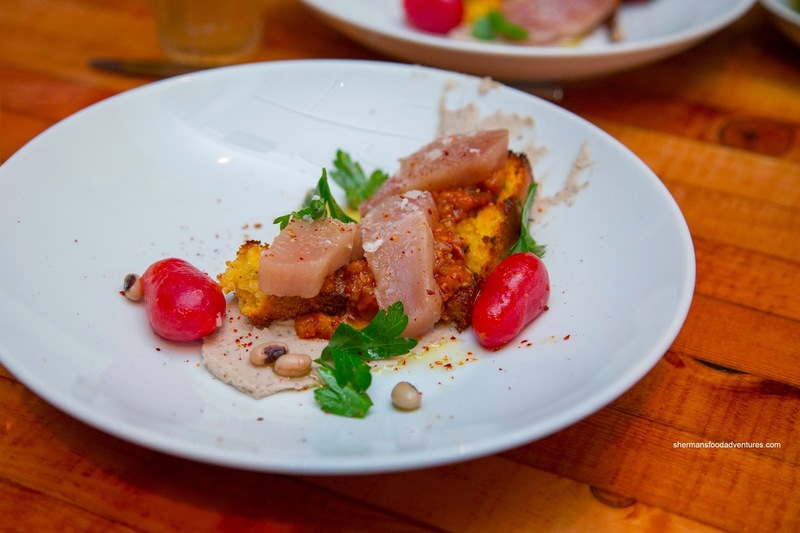 Consisting of raw albacore tuna, spicy eggplant, black eyed pea puree and cornbread, the tuna was a composed dish. It was buttery soft with a purposeful smoke flavour. The crispy and firm cornbread added some body while the eggplant ensured there was some heat. Our last stop was some place I had passed by earlier in the day. Simply named The Emerald, I thought it was not open. Well, apparently it opened a few months back and with a eclectic decor, live music and extended hours, it has potential for a late-night dessert spot. 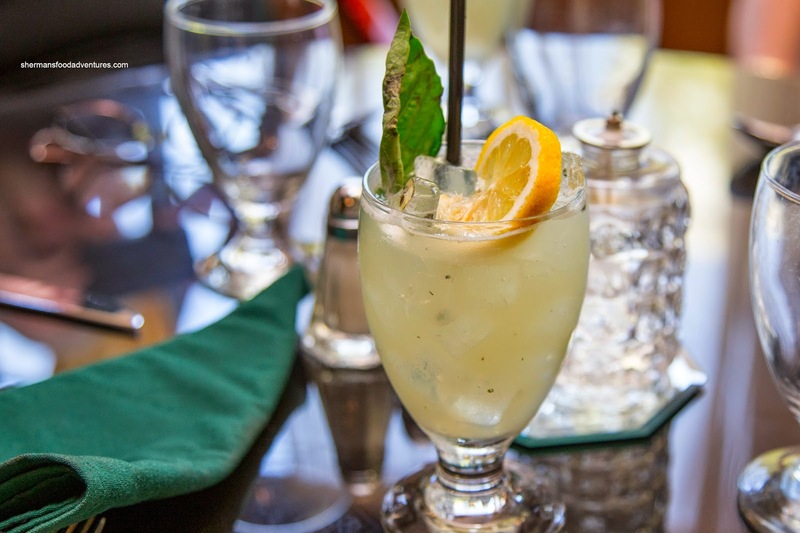 We had yet another cocktail, this time the Gin Basil Smash. Thankfully all of the drinks were refreshing and this one was no exception with the zip of lemon, the lightness of gin and of course the herbal basil. 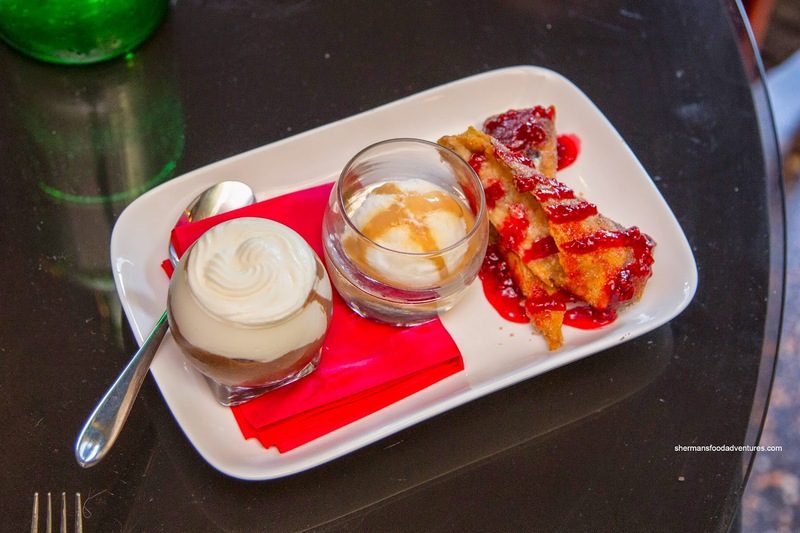 To end things off for the tour, we were served a trio of desserts including Chocolate Mousse, Coconut Gelato and Banana Cheesecake Spring Roll with raspberry coulis. I found the mousse light and not overly sweet, yet it could've been stronger chocolate-wise. The gelato was smooth and creamy with an aromatic coconut hit while effectively sweet. As for the spring roll, it was crispy with a sweet banana cheesecake. There was a bit too much coulis though. Now if you were paying attention, we had 3 full-sized cocktails, 1 glass of wine and a total of 9 food items. Suffice to say, we were both full and potentially intoxicated (I held back because I had to drive). For all the other food tours in Vancouver, this tour had the best combination of drinks, real portions of food and quality establishments. Sure, it costs the most, but there is a reason for it.